Why send Thanksgiving flowers? Thanksgiving is a holiday with a long history in North America. It is often associated with the Pilgrims of Massachusetts, but some claim the first Thanksgiving actually held on this continent took place in 1578 in Newfoundland, when English explorer Martin Frobisher held a ceremony to give thanks for having survived his failed attempt at finding a northern passage to the Orient. After this first celebration, other variations on Thanksgiving occurred in locales across North America. Some were occasions for giving thanks, while others owed their origins to the harvest festivals that were common in Europe at the time. By the late 1800s, Thanksgiving was enshrined as a national holiday in both Canada and the United States. For most people food is the primary focus of this holiday. In fact, the imagery of Thanksgiving is filled with nature’s bounty – gourds and squash, turkey and cranberries. Those images often translate to your home’s decor in the form of centerpieces and other decorative accents. Small gourds and pumpkins are often used to adorn the table. Parents of young children may also add a special craft made at school. Acorns and leaves are also common ornaments. But flowers are often overlooked as decorative elements for the harvest table. 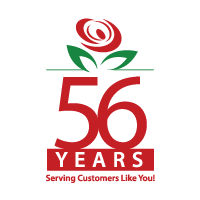 Flowers are associated closely with other holidays – think of the lily at Easter or the poinsettia at Christmas – but the notion of Thanksgiving flowers is not as commonplace. The vivid palette of colours that emerges in fall is ideal for a floral arrangement gift. And there is no need to limit yourself to a centerpiece. Flower arrangements outside and in the common areas of your home add a welcoming touch that your guests will certainly appreciate on any day of the year. 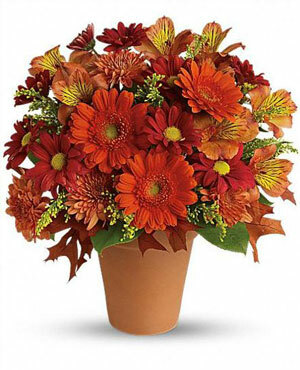 Thanksgiving flowers, or fresh fall flowers, come in many varieties and colors, providing almost limitless options for arrangements. The combination of deep autumn reds, oranges and yellows can be found in traditional Thanksgiving flowers, like chrysanthemums, sunflowers and gerberas. Other Thanksgiving flowers include carnations, solidago, monte casino and marigolds. But you are not restricted to Thanksgiving flowers only. Roses and lilies are also available in fall colors and add a touch of classic beauty to any arrangement. And don’t forget to accent your Thanksgiving flowers with other holiday touches – wheat, acorns, oak leaves, small gourds, corn cobs or even a pumpkin vase. You should use a round centerpiece for a round table and a long centerpiece for a rectangular table. 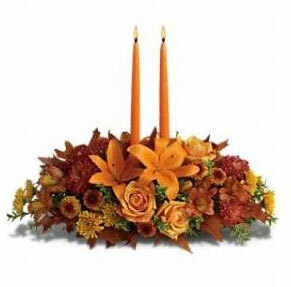 Add candles to your centerpiece to soften the mood. If you have a large table, use a few small arrangements to complement the main centerpiece. Colorful fall leaves can also complement the main centerpiece. Select leaves in a variety of colors and shapes. Oak and maple have a distinct appearance often associated with the season. 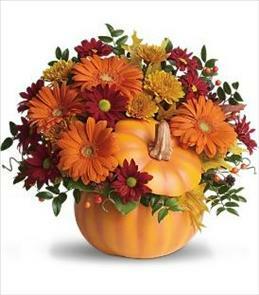 Many florists offer stunning wreaths made of Thanksgiving flowers and other fall accents for delivery. A wreath on your door provides a warm welcome to your home. And, instead of the usual bottle of wine, try Thanksgiving flowers or baskets as a hostess gift. Whether it consists of a bouquet in a traditional vase, a glass hurricane and candle, or a cascading cornucopia, a beautiful arrangement in fall colors will be received with great thanks.